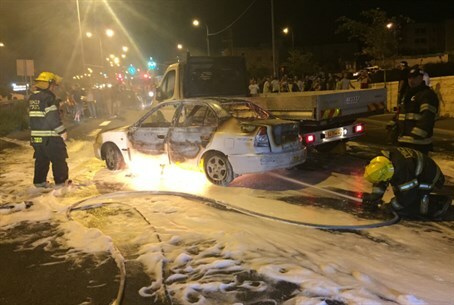 Video shows car set ablaze by Arab terrorist as it rolls into intersection after firebomb burns Inbar Azrak, 27. A video on Youtube shows the car of Uri and Inbar Azrak as it rolled into Jerusalem's Beit Hanina intersection, near the Ben Tzion Interchange. Uri and Inbar were no longer in the car when the video was shot. Inbar, 27, who was wounded in Monday night's firebomb attack, spoke out about her ordeal Tuesday. "We were returning from Jerusalem from a vacation, my husband Uri and I," she recounted to Army Radio. "Suddenly we heard a very loud 'boom.' The car was filled with fire." "He shouted at me: 'get out! get out!" she continued. "I struggled and finally managed. Uri helped me extinguish my skirt, lay down and call for help. I asked someone to call an ambulance." An IDF soldier rushed to the scene; Inbar added that, thankfully, others also stopped to help - due in part to the fact that the attack unfolded on a main road. MDA medics gave Inbar medical treatment and took her to Hadassah Ein Kerem hospital with first and second-degree burns on 15% of her body. She was reportedly fully conscious and stable. Her husband Uri was not injured. The vehicle was completely burned.